"Hey Hey Helen" was an album track from the 'ABBA' album. It was the b-side of the "Fernando" 45 in most countries. During a promotional visit to the US in the fall of '75, they performed the song on TV. Thanks to http://www.abbainter.net/ for this clip. 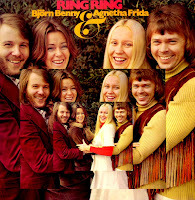 Not quite ABBA: 1973's Ring Ring LP. 1973's Ring Ring was admittedly not a strong album. It contained material from a wide variety of sources. Benny and Björn had been trying to make it as a duo since leaving the groups that had brought them fame in the '60s. A few of the tracks on Ring Ring were simply songs that they had come up with during that time, with the girls singing backing vocals. Agnetha had been a singer/songwriter before the group started, and she contributed the beautiful, yet out of place "Disillusion" to the album. The lyrics were not all that great (particularly on "Me & Bobby & Bobby's Brother") and often dealt with trivial subjects. "I Saw It In The Mirror" has to be one of the group's most forgettable songs, almost painful to listen to. There were glimpses of the future greatness that the quartet would achieve: "Nina, Pretty Ballerina" and "I Am Just A Girl." Still, the title track remains the group's first real gem, ushering in the legendary "ABBA sound." But mostly, Ring Ring contains tracks that showcased the group's potential without quite succeeding in convincing the listener that they had what it took to become a genuinely successful international group.